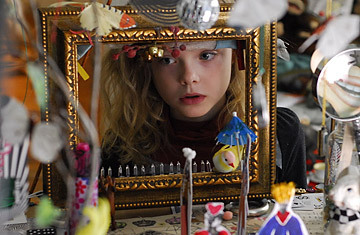 Elle Fanning, the star of Phoebe in Wonderland, turns 11 this April. She made her debut at two, playing a younger version of her sister Dakota's character in I Am Sam, and already has 27 movie and television credits. To be so experienced as a child actor can translate on screen to a preternatural poise that, while admirably skilled, tends to creep out us mere mortals. But in her first real starring role as a troubled, Alice in Wonderland-obsessed 9-year-old, Fanning gives the kind of heartbreaking performance that makes you want to yank her off the screen and make it all better. Her work is without contrivance. The same cannot be said for writer/director Daniel Barnz's film. It is earnest, but uneven, sometimes getting lost in its desire to be different. The plot is woven from multiple fixations with Lewis Carroll's classic. There is Phoebe, who knows the book cover to cover, thanks, at least in part, to her mother, who has been unsuccessfully working on a dissertation on perversions in Alice for long enough to have taken on a twitchy, Mad Hatter-like look herself. Then there is Phoebe's drama teacher, Miss Dodger (Patricia Clarkson), who approaches directing an elementary school production of Alice with the dedication of Bertolt Brecht. Miss Dodger wears her hair in severe braids wrapped around her head, which have apparently squeezed all affect out of her. Alice in Wonderland is certainly witty, hallucinatory and supple enough to still be fueling plays, movies, musicals and yes, academic works (though Hillary's dissertation sounds as if it were written by Camille Paglia 30 years ago). But here the homage, meant to intrigue, keeps interfering with the compelling, modern story about a child who needs help but isn't getting it. Barnz's intent isn't always clear. For instance, are all the adults in the movie meant to be as unhinged, baffling incomprehensible and irritating as the guests at the Mad Hatter's tea party? That's how Clarkson and Campbell Scott, as Phoebe's principal, seem to be playing it. If Barnz wants to put us through an experience of frustration and miscommunication, mirroring Phoebe's own, fine. But if that's what he's up to, he fails to maintain a coherence of tone within that narrative technique. At one point, Phoebe does something quite dramatic and dangerous. The movie has been steaming steadily toward this foreshadowed moment, and we feel it coming as a reckoning, involving shrinks, medication, and if Phoebe is lucky, rescue. Instead Barnz, bizarrely, softens it and turns it into another trip to the principal's office, stretching his credibility past the breaking point. But what Phoebe does have on its side, other than Fanning's exquisite delivery, is its provocative look at motherhood. On Desperate Housewives, Huffman is mostly mired in the silly slapstick of parenthood, but in Phoebe she really gets to dig into the painful dichotomy of a stay-at-home mother who longs to have professional success. Like the smug academic dad in The Squid and the Whale, Hillary believes that her child is different from other kids in a good way, an offshoot of Hillary's own genius, which has been unfairly suppressed by domestic horrors like cooking dinner. In actuality, she seems to treat motherhood as a part time job. But as grating as the arrogant, insecure Hillary is, she's genuine. Listening to her expound on how over-medicated our society is, you may recognize how easy it would be for a defense of one's child to serve as blinders to the truth. In the end, the good in Phoebe, powered by Fanning's transcendent performance, outweighs the bad. But it's hard to know exactly whom the film is for. The fantasy element of Alice will likely provide a lot of allure to little girls. But their parents, eager for a happy afternoon out at the movies, should be prepared for all the troubling realities (including some vivid language) down this particular rabbit hole.